If you are looking for a Lilac for smaller gardens, then Syringia pubescens ‘Miss Kim’ is one of the best. The full name is Syringia pubescens subsp. patula ‘Miss Kim’ and with its tidy growth habit and fragrant flowers it is suited to growing in containers. Occasionally sold as the ‘Manchurian Lilac’ it has been in cultivation for over 70 years. 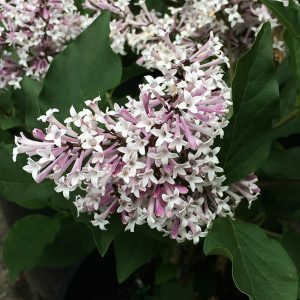 Commonly called the Dwarf Korean Lilac it will reach around 3 metres in height over time with a spread of around 4 metres. However growth rate is slow and it is very easily pruned to maintain size if required. The fragrance is spicy and the flowers appear a little later in the season than most other lilacs. Flowers appear in tight clusters, tubular with pink on the outside and white interiors. Foliage is deep green, with good autumn colour to round off the season. Being a compact grower, this is an excellent choice for growing in containers and smaller spaces. Although it is commonly called a ‘Dwarf lilac’, over time it will need to pruned to maintain shape and size. Drainage is important, so ensure that the soil in the garden in free draining, and that containers have adequate drainage holes. Like most lilacs,’Miss Kim’ grows well in a humus rich well drained soil and prefers full sun. It will grow well in a little light afternoon shade, deep shade will restrict flowering. Dig in some well rotted compost and a little lime before planting. Water in well after planting and mulch to maintain a cool root run. Young plants are best staked until they develop a strong root system.